Matthew Winterroth began his career at Duane Morris in the Intellectual Property Practice Group in Newark. 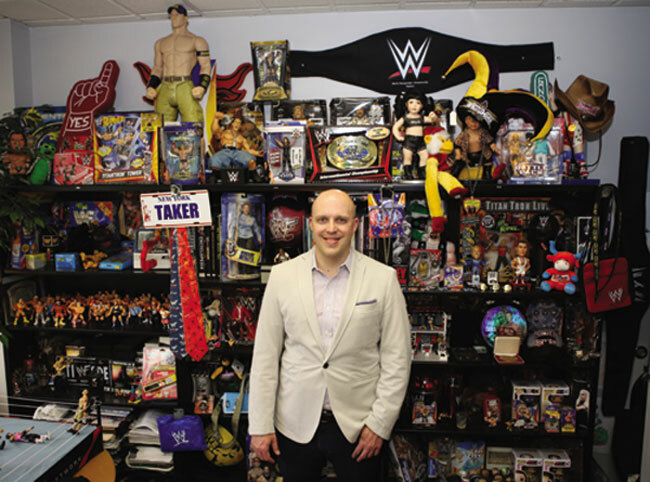 Since 2011, Matthew has been part of a team dedicated to protecting and enforcing IP for the billion-dollar sports entertainment company, World Wrestling Entertainment. Below, Matt shares his story about working at WWE and how his time at Duane Morris primed him for the challenge, as well as which wrestler is his counterpart. Q: Describe your day-to-day work at WWE. A: No two days are alike at WWE, but I lead enforcement of WWE's worldwide intellectual property portfolio by way of implementation and administration of extensive and aggressive anti-counterfeiting and online anti-piracy programs. I directly manage domestic and international anti- counterfeiting efforts online and offline through local counsel, third-party vendors, investigators, payment processors, hosting providers and local and federal law enforcement. This includes overseeing customs training and enforcement programs in more than 40 countries. I also conduct the removal of unauthorized user-generated content and peer-to-peer video sharing, takedown notifications under the Digital Millennium Copyright Act, domain name recovery procedures, social media and mobile app monitoring, as well as livestream enforcement during our premier events such as WrestleMania and SummerSlam. On the corporate side, I counsel WWE's internal business groups regarding the best branding strategy for developing, enhancing and protecting strong intellectual property rights globally. I also negotiate and draft a wide variety of commercial agreements (e.g., licensing, vendor, sponsorship, digital, sweepstakes, charitable, consulting, publication, etc.). Q: Your three-person IP team was named the Sports, Entertainment & Media Team of the Year in 2015, as well as being nominated for the North America Team of the Year, at the World Trademark Review Industry Awards. (The team was nominated again in both categories in 2016.) Tell us about that. A: This was a wonderful honor and surprise for us, particularly since my boss Lauren Dienes-Middlen made the shortlist for In-house Counsel of the Year. At WWE, Lauren and I manage an intellectual property portfolio consisting of more than 9,000 worldwide copyright registrations and 8,000 active and registered trademarks in more than 80 countries. On top of that, our team oversees a global IP program of more than 150 licensees (creating everything from t-shirts to toothbrushes), television production, book and music publishing, studio films, video games, home video, live events 52 weeks a year, mobile app creation and social media rollouts covering over 600 million followers, including the top-ranked sports channel on YouTube with more than 10 million subscribers and more than 8 billion video views in the last 12 months. In essence, WWE is not just weekly television programming and WrestleMania. It's a fully integrated media organization and leader in global entertainment that has a diverse range of IP issues very few companies and organizations have. This, of course, is both a blessing and a curse, but it was wonderful to be recognized for that. a statue of Andre the Giant in the lobby of WWE headquarters. Q: WWE's legal team was also selected as one of the Ten Most Innovative In-House Legal Teams of 2014 by Financial Times. What are some examples of the team's innovation? A: 2014 was a very interesting year for WWE. In the 1980s, Vince McMahon and WWE (WWF at the time) virtually invented the concept of pay-per-view. In 2014, WWE once again contributed to the evolution of the media landscape with the rollout of the very first subscription-based over-the-top, 24/7 linear and on- demand streaming platform, the WWE Network, available on various Internet-connected devices in over 170 countries and territories, and now with more than 1.82 million subscribers. 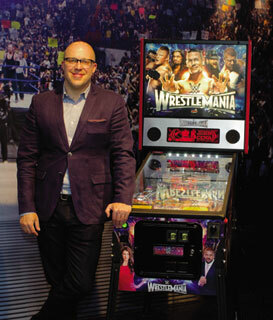 This, coupled with the simultaneous re-negotiation of major television licensing deals in the United States and several key international jurisdictions, demanded WWE's eight-person in-house legal department to collaborate and develop unique and innovative legal methods and strategies to deal with everything from overcoming domestic and international regulatory hurdles concerning the WWE Network launch, to rolling out a real-time fingerprint matching technology to deal with instantaneous and automated enforcement for our valuable video content. Q: How did you transition from a law firm to being in- house? What was attractive about the position? A: The transition was quite seamless, and that's a testament to the training and exposure I received at Duane Morris. A lot of our interns here at WWE inquire about trying to migrate in-house right after law school, but I encourage them to gain invaluable experience working at a law firm, whether it be big, small or somewhere in-between. Of course, I used to watch WWE growing up in the 1980s with Hulk Hogan and “Macho Man” Randy Savage. But to be honest, I did not know too much about the evolution of the brand before migrating in- house to WWE. However, I did know that their IP portfolio was as wide and varied as the IP issues they faced, and to me that was the most attractive part of joining the WWE family. I've been interested in IP topics my entire legal career. I went to a law school with a strong IP bent, and upon graduation, I immediately worked in the IP practice group at Duane Morris, so moving in-house to work on diverse IP issues was just a natural evolution. Q: What is your best memory of working at Duane Morris? A: I remember getting thrown right into the fire doing interesting work. When I started, I worked in the Newark office with a partner who had just taken over the entire trademark portfolio for Las Vegas Sands Corporation. That work, as well as assisting with the management of the Lockheed Martin trademark portfolio, provided hands-on experience with two very interesting, yet vastly different industries during my tenure at the Firm. It certainly gave me great exposure into how companies monetized and enforced their intellectual property. A: I grew up overseas, so international travel is a huge passion of mine. I'm also an avid reader and love to ski come winter. As part of a small legal department, I'm always on call, so professionally, I also enjoy representing WWE as a member of the International AntiCounterfeiting Coalition (IACC) and the Coalition Against Online Video Piracy (CAOVP). Q: Have you been to WrestleMania and who is your favorite wrestler? A: Yes, I've been to WrestleMania, but I'm not just enjoying the spectacle. Instead, I'm monitoring our video anti-piracy efforts during the event and also assisting law enforcement on the ground, seizing counterfeit product! I'd definitely have to say Dwayne "The Rock" Johnson is my favorite. We're very similar he and I—he "lays the SmackDown" on his opponents, and I do the same to infringers of WWE IP all over the globe! One of the many offices overflowing with WWE memorabilia. Look closely for treasures.